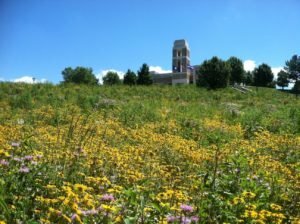 Scroll down to see the pictures of James Madison University’s “Hillside Project.” The native prairie is now in full bloom. You can see it from I-81. Some think it looks terrible and want it put back in manicured lawn. Help save this wonderful outdoor classroom by posting your comment at the bottom of this post. You can share it and like on Facebook also by clicking on the icons at the bottom of the post. Go ahead, read on. What is America’s obsession with a manicured lawn? We plant, fertilize, water, lime, rake and apply pesticides so we can look at it. We use mowers and blowers and irrigation systems to perpetuate this “look”. I have a relative that spends more time on his lawn than with his family or his job. I think for many it’s an escape from reality. Do they really not have anything better to do than mow grass? And I shake my head every time I ride by a McMansion with five acres of lawn to mow. What a waste of space – we could be growing food there! I loathe mowing the lawn. I would rather spend my time doing something productive or fun like growing food or flowers or riding my horse. I certainly don’t want to put any fertilizer on it or water it so I have to mow it even more. 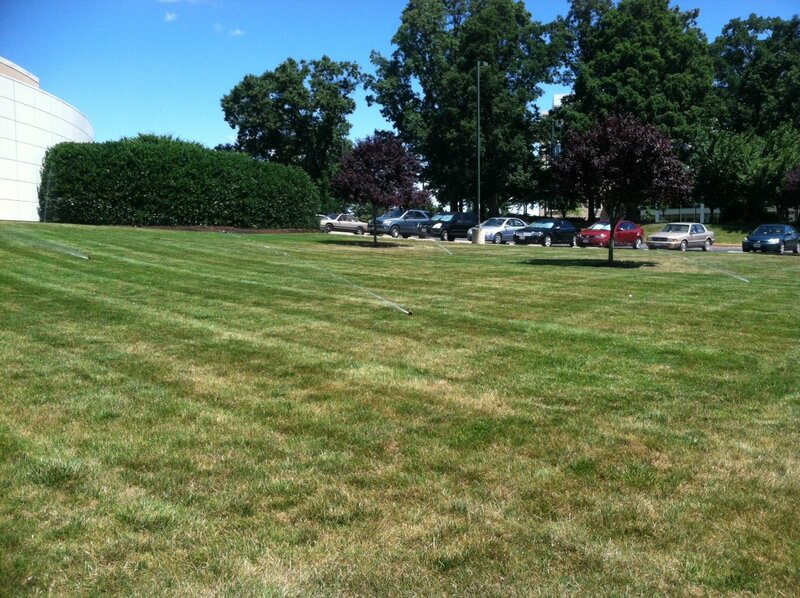 One of our goals at Meadowview is to get rid of some lawn every year. According to an article in the “U.S. News and World Report” there are over 40 million acres of lawn in Amercia. Imagine if everyone grew more food in their garden than they had lawn to mow. Lawns are pretty sterile landscapes. Not much wildlife there. I remember a conversation I had with one of my relatives who lives in one of those golf communities. His house is beside one of the tees. Everything is manicured and the grass has so much nitrogen fertilizer on it that it’s what we call in farming “black green”. He said he had never seen a lightning bug there. At James Madison University there’s a project going on to enlighten people about utilizing space in a more productive way than just tending to a lawn. It’s called the “Hillside Project”. It does not advocate getting rid of all lawns but it certainly demonstrates that “lawn” space can used in better ways. They took a couple acres of “manicured lawn” landscape and turned it something magical – a native landscape. They planted native prairie in one section and native trees and shrubs in another. They even took a 1950’s “hard” engineered stream bed and turned it into a natural stream system. The landscape is now alive with blooms, bees, birds, butterflies, hope, diversity, wonder, opportunity and change. In these pictures you can see Brown Eyed Susans, Bee Balm and Sun Flowers; there’s a lot of other things in there too! It’s a great place for students to learn about natural communities, botany, biology, ecology, pollination, taxonomy, and politics…the list could go on. Unfortunately a few folks in the administration think it looks unkempt and are taking steps to undo the “native prairie”. It just doesn’t have that “university look.” But isn’t that the point? A university is supposed to EDUCATE and CHALLENGE the status quo for the betterment of humankind. We do not need all those manicured lawns; it wastes space, resources and time. In addition it pollutes the water via fertilizer runoff and pollutes the air from the 40 million lawn mowers and grass blowers. You can help me save this wonderful outdoor classroom at JMU by posting your comment here on this blog or email it to me. I will forward them to the administration at JMU. You can share this with others too by clicking the icons below. Your comment might be the one that turns the tide. Thanks for your help. Very many people have put research, time and effort into promoting this great exercise in sustainable land management. We will be compromised if it is to go. What a loss this would be. I too hate to mow the lawn and this provides great diversity to the landscape and wildlife. It looks great Bobby. I think it’s beautiful and all the blooms are so nice. I think it looks way better than just another patch of grass. Plus, I agree with your purpose-to teach. If they are worried about what people think of it not being a manicured lawn, maybe the could put a sign up and educate the public as to what is going on there and then it would be appreciated even more. One of the few pleasures of driving on I-81 is seeing fields such as this planted in native wildflowers. Please preserve this patch of beauty for our enjoyment! As a technical specialist in the field of conservation, I would like to encourage the continuation of the Hillside Project. From a conservation perspective this area serves as a medium to instruct both students, faculty, and visitors in the sustainability of the natural resource base. The basics as well as the intricacies of the interdependence of soil, water, air, plants and insects serve as real-time classroom. What more could Pres. Madison’s University want–or need–for education of its students in these important fields? And does a top-level Virginia university “really not have anything better to do than mow grass?” Isn’t that excellent teaching facility saving the institution serious and precious public $$$ every day? In addition to the ecological benefits, there are excellent cost savings — I urge JMU to KEEP IT WILD! Universities are drivers of public policy and opinion. Students pay exhorbitant amounts of money for the information they receive there. Therefore, universities should feel highly responsible for the tone they are setting. I would not expect them to continue to put out the same ‘ole, same ‘ole, otherwise why should they exist? When passersby see something “different” with this Hillside Project, it SHOULD get them to pay attention, to think, to ask questions about what is its purpose, its value? Sounds like it is meeting those goals already. Looking at it from the other way, what would be achieved by turning this area back into mowed grass? Only that everyone would go back to sleep. Aside from being much more beautiful and biologically diverse than a lawn, the Hillside Project is a great advertisement for the school– it suggests that creative and exciting things are going on there. In my work with Friends of the Middle River, I have learned a great deal about the value of natural landscapes and their contribution to reducing runoff into streams and creeks. I agree that the role of a university is to lead by example and to educate young minds about ways to be good stewards of the land. I am told that the fertilizer budget alone at large universities is well above $1,000,000 per year. JMU may be in that category and could realize substantial savings by doing more, not less,to convert lawns to natural areas and make the conversion a teaching experience. I sincerely hope that reason overrides aesthetics as regards the Hillside project at JMU. Why not be a leader and role model for their peers? I agree with your article 100%. I just retired from the Lady Bird Johnson Wildflower Center (wildflower.org) whose mission is to educate people about the use native plants. We recently developed a grass seed, habiturf for those people who want some yard. We’ve been in a horrible drought here in Austin which has definitely helped spread the message! In the interest of transparency I should start off by revealing that I work for the organization that planted this meadow so I suppose i have a “bumblebee in this fight “. This wild patch is packed with wildflowers that pollinators desperately need in our overly manicured world today. At least two species of native eastern bumblebees (rusty patched and yellow banded) are vanishing. Meadows like this can help these and other troubled pollinators THAT HELP TO FEED HUMANS !! !Please note that I do NOT think that feeding or helping humans should be a requirement for critters being allowed to stay on the planet! This meadow is not in a central campus location so that the average visitor would have to seek it out. It is inconceivable to me why anyone would want to eliminate this nice flowery patch when there is plenty of mown lawn available elsewhere on the campus ? It can serve as a great outdoor classroom about restoration, pollination, meadow management, etc. Please give this meadow 10 more years before you make a decision about eliminating it. I bet you find that it grows on you ! JMU should be PROUD and flaunt their forward-thinking and ecologically friendly use of their land for such a beautiful and beneficial purpose. To revert this back to a barren manicured lawn would be an unspeakable mistake for all of the reasons mentioned above. I too have worked in soil and water conservation and it was continually our effort to educate landowners about the untold benefits of “wild” spaces full of native species of flora and fauna. Large landowners, be they universities, hospitals, corporations, or individuals should all follow suit and learn about the alternative ways to use open land. JMU doesn’t realize what an amazing asset this could be to their community in addition to all of the ecological benefits it has. This looks amazing and alive and sustainable! Thank you JMU for taking this initiative. Please don’t move backwards as a response to something that is simply an obsession. People will adjust. We need to take these steps – big and small – make these changes that show we care what happens to our earth. President Madison was well ahead of his time when he preserved the old growth at Montpelier. What has happened since 2009 to lessen the university’s commitment in this area? JMU should be striving to set an example for the students with whom they are entrusted and to the larger community. Destruction of such a project is short-term thinking at best and, if allowed, a very worrisome indication of the overall direction in which the university is moving. What other Defining Characteristics are being abandon? This is a great article on field conservation and sustainable land management. I have made plans to make a FB group to find more support and keep the prairie alive. I would hate to lose this precious environment that has been created on the hillside. It only takes taking a visit there now to witness the beauty that this land practice brings to our campus. I do not think I have ever seen so many different species of birds, insects, and creatures. Lets keep the prairie alive! You cut down our tree on the quad because you were afraid someone would fall out. You ripped up the quad before the underpass was even dug. You have an interstate going through campus and you are worried about things being unkempt? Put up sound barriers and clean up the bottles of urine people throw out before attacking a natural landscape/classroom and embrace your identity as NOT UVA but the University of the Shennandoah valley. Our president’s name is LinWOOD ROSE not KENTUCKY BLUEGRASS! Get it together. Native land increases biodiversity, therefore this prairie effectively increases biodiversity. In turn people benefit from the products of biodiversity: resources like clean water and air, food, stabilization of climate, and continued biodiversity. This prairie could provide exponential educational opportunity for JMU’s future students, faculty, administrators, and campus visitors. JMU should continue educating. I recently heard that the hillside project was catching some pr flack for looking untidy and unattractive. It was my impression that there was an educational component to the project and that it was supposed to raise awareness and understanding of environmental issues. In my opinion, if people are complaining about it, the hillside is functioning as intended and provides an opportunity to educate someone who obviously doesn’t get why it is such an amazing and beautiful project. Change is not an easy thing for people, but you have to start somewhere and you have to stick with it and face challenges. If the hillside project is going to be terminated I will seriously be disappointed with JMU and question the cutting edge direction it was headed. Please hear my voice and don’t let that happen! This meadow represents a new aesthetic in opposition to the ecological desert of a manicured and sterile lawn. JMU should be proud of this meadow – not second guessing it. It also serves as a great public example of what their neighbors can do. As a recent JMU graduate, I’m aware of the university’s increasing interest in sustainable landscaping. In two courses I took in 2010-2011, we helped implement a raised bed rooftop garden on the third floor ISAT patio. This is just one of the many “green” projects popping up all over campus. All of those involved in the rooftop garden have immensely enjoyed seeing our work grow and progress while we learn from it on a daily basis. I love getting my hands dirty up there and then looking over the wall to witness our values spilling over onto the ISAT Hillside. The native prairie project is one more magnificent and educational example of responsible Earth stewardship. To retract this work would be a step backwards, not only for JMU’s Institute for Stewardship of the Natural World, but also for the University and Shenandoah Valley as a whole. Please, save the prairie. I agree wholeheartedly: “A university is supposed to EDUCATE and CHALLENGE the status quo for the betterment of humankind.” There is no good reason the Hillside Project should be lost. Education provided by the beauty of this Hillside Project should be preserved and treasured. There is enough grass and too many manicured lawns already. Let’s save this hillside. We need more flowers and color to brighten each day. I had 13 acres of land which I mowed to perfection. 5 years ago I sold 10 of it and the folks who bought it decided not to mow. At first I was upset but up popped a meadow with high graases, shrubs and wild flowers. The wildlife is coming back . Not that I don’t like beautiful lawns but nature is beautiful. We should enjoy both. The flowers in the pictures I saw were exquisite. No lawn could top that type of beauty. I hope you perserve it, so do the critters but they can’t blog. Bees pollinate flowers of plants/herbs that feed the hungry mouths of hardworking students who’s bodies convert the nutrients into energy that powers the Minds that JMU nurtures and grows — The Minds that help create change through Imagination — The Imaginations that expand to turn ideas into Reality — The Imaginations that inspire Innovation. Innovation – is defined by Creativity. Creativity is defined only by those brave enough to use it. Those brave enough to use it, created this prairie landscape to help increase and promote biodiversity on JMU’s campus, as well as to learn from the world’s best teacher – Mother Nature. JMU – You created these minds. Nurture them by nurturing Nature. Inspire them with your own ideas of Innovation. Let them stretch to their limits and beyond. Grass is nice for places to people to play almost everywhere else it is wasteful and bland. JMU has way more than enough grass please expand the hillside project. JMU is a lovely campus. There are trees aplenty and wide open grassy spaces for folks to frolic. The Hillside Project makes a compliment to manicured spaces and provides texture to the rest. Large lawns and stately buildings are dandy and create a traditional emotion of stability. They also however lack whimsy and imagination. The Hillside Project has provided color and bounce to a sometimes boring monotone. It should be expanded in a significant way. But perhaps most importantly to me is that the Hillside Project has provided a place to go that is easily accessible where I can see native grasses and wildflowers without driving unreasonable distances. I grow weary of having to travel just to see a specimen of a flower I’ve seen in a book. The Hillside Project puts that flower on my doorstep. What a great place ! Be strong, folks! Stay the course. Forget killing the project. Expand it. And thanks for placing it there for my enjoyment in the first place ! This meadow IS beautiful and needs to remain in place. Why some people at JMU would want to replace it with a lawn is incomprehensible. JMU is a learning institution and this meadow has a lot to teach the students about biodiversity and sustainable systems. Wake up JMU and smell the prairie flowers!! Save the Hillside project. Show some vision JMU. Think of the money you will save by not having to tend that area. That is what drives you right? Money. To replace the hillside project would be an enormous mistake… We are at a point in time where restoring balance and intimacy with Nature is more important than ever. Looking into the future, projects like this will make JMU a role model for other schools around the country. If we choose to go back to our outdated ways of manicuring grass, a completely useless, meaningless, and mindless practice, we will be telling future generations that we care more about the grass than their future. More sustainability, Less Stupidity. I too find excessive lawn fixations to be a waste of time and money. Too much about JMU is ornamental now and one less patch of it by the ISAT building is a great thing. I applaud the Hillside Project and would love to see it continue. I’ve always been proud of JMU’s sustainability and conservation efforts. I am proud to go to a university leading in LEED buildings, recycling efforts and sustainable education. I would be very disappointed if the university chose a PR-safe ugly, boring, landscaped lawn over innovative, sustainable, educating and beautiful natural prairie. As a JMU alum and Harrisonburg resident, I am appalled that there is even a slight chance that this meadow could be mowed down. JMU is recognized by most as a beautifully landscaped campus. Here is one place and opportunity to showcase a native, natural, sustainable and ecologically responsible meadow. To many, including myself, it is beautiful, but it’s not really about how it looks. It’s about how it is. And it is by far the more environmentally and economically sound decision to keep the project as is. JMU is a master of manicured grass. Let it also be a steward of the Shenandoah Valley’s ecological diversity. The Hillside Project offers a unique experience for many JMU students through hands-on experience and by broadening their perspective. The author hit on the second point quite well with his criticism of America’s fixation with “lawns.” Why shouldn’t JMU use this area to combat that outdated ideal? Folks, I can’t thank you enough for all the support and wonderful comments posted here on this blog about JMU’s Hillside Project. I learned today that the Hillside Meadow is not in jeopardy of being taken out. The issue was undesirable plants in the Meadow and Dr. Teele has taken care of the undesirables for the moment. What we must do, those of us at JMU, is to continue to monitor and take out the plants we don’t want in the Meadow. These for now are thistles, pokeweed and prickly lettuce. The Hillside Committee will be meeting soon to develop a “weeding plan” so the misunderstandings won’t happen again. Thank you again for your support. If you go by the Hillside and see any of these undesirables, please just take them out. If you have further suggestions or want to help please let me know. Bobby, you evidently don’t need more comments at this point as it appears the meadow is not now in danger. I won’t go into the amount of money being wasted by watering going on now at the new athletic fields on Port Road and the maintence that would be requred. But I would like to say that thistles [I bet you hate that word] are a good butterfly food source. Jerry, thanks, about the thistles, yes. They are also Gold Finch food and nesting material. I still hate them. I am sure we do not yet know the value of many things we don’t like…. Nature is wild, therefore, wildflowers. Is it beautiful that way, and meant to be that way! Clean cut lawns are not appealing.. they are boring.. tamed.. dull. Let Nature be it’s true self, WILD! Keep the Hillside! Dear James Madison University, please reconsider your proposed elimination of the Hillside Project. 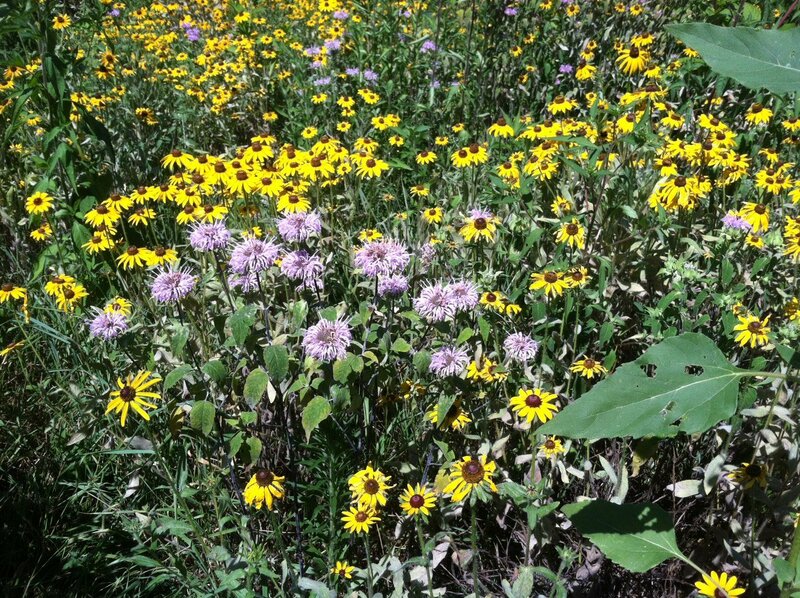 Native prairie provides a diverse ecosystem that protects and enriches animal life. Insects especially are under constant attack from reduced wild spaces, chemically treated farm fields, and hybrid ornamental plants that produce less pollen and are less appealing to insects. Diverse ecosystems absorb and store more water, require less watering and fertilizer, and are beautiful. I love the Hillside Project and so has every student I’ve asked about it. It’s a nice break from all the manicured lawns and there is so much diversity and wildlife in that area. I would always pause on my walk to classes to view it and see the wildlife there and it was very relaxing. There are way too many overly manicured areas of JMU where they are obsessed with watering everything in site, including the sidewalk in the middle of the day. It is so refreshing to see a natural environment on campus. If help is ever needed taking out undesirables please email me and I will be more than happy to come help out. One more JMU alum against destroying the beautiful Hillside Lawn! We need to actually “Be the Change”, which means not falling into the formula of what a University ought to look like. Instead of spending so much time focusing on ‘that University look’, we should be cultivating ingenuity and an engaged, creative culture; manicured lawns just serve to craft 1000000001 Mr. and Mrs. Joneses. Love this article! Thanks for your kind words Nelle and for stopping by. Those are some great pictures of the hillside, it honestly looks (in bloom) a million times better than just plain grass. I think the main issue is the hillside in the fall/winter time, which is understandable but we still need some patience from the jmu population for it. I didn’t realize how complicated it was to create this hillside and all of the administration that you had to go through. Are you planning on creating any more of these projects anywhere else on or around campus? Also are the people who were in charge of the Hillside project also in charge of the retention ponds? I noticed that they had some riparian life, it was nice to see that. I’ve been thinking a lot about “that could be farmland” idea and hopefully I can convince my parents to let me plant a garden for them in their backyard. Thanks for the post professor. It is a shame that members of James Madison University administration would want to do away with the native prairie for aesthetic reasons, especially when the aesthetics of a manicured lawn on a hill is debatable and subjective to begin with. JMU should look to constantly challenge its students, donors, and affiliates to “Be the change you wish to seek in the world.” JMU’s own mission is, “We are a community committed to preparing students to be educated and enlightened citizens who lead productive and meaningful lives.” The Vision and Values statements of JMU also state that it is a University to be the leading comprehensive university and to have a student-centered community that values excellence, integrity, and mutual respect. These are all very interesting stated values and visions that do not, in my opinion, line up with the perspective to remove an outdoor classroom, a native Virginian display of culture, and also a means to protect our environment whether that is the stream at the base of the hill, the soil ecosystem, or the native animals that thrive in the native prairie. I believe that it is important to always evaluate your surroundings and self-evaluate the values for which you stand. Also, in my opinion, I do not believe that the administration that wants to remove the native prairie is acting on behalf of the vision of the university and especially not in the interest of producing contributing members of society. I hope that not only does the native prairie stay where it is, but that it is continually used as an outdoor classroom for students to learn and grow as the leaders of our generation. I hope that the select members of the administration re-evaluate their views and act on the interest of our generation rather than in disdain of their personal views on the aesthetics of a display of our native Virginia. 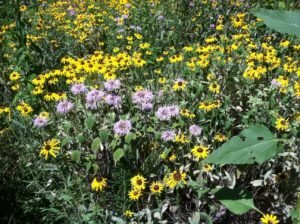 Add more native prairies!! Thank you Chris for your very well thought out post. This is a great post! I actually just learned the meaning of the Hillside Prairie this year. I know there is a sign and other sources, but maybe more needs to be done to inform the community of the reason for the prairie. For example, this blog. I also agree with Erica’s post, the problem is not when it is in full bloom it is in the colder seasons when it looks as it does at this time. It is beautiful as shown in the pictures when it is in full bloom. Thanks for the post! I remember when I first noticed that the Hillside Project was taking place, my first thought was that I was impressed that the university was doing a project like this. However at the time I was not aware of how many benefits this natural hillside could provide. Walking through the project while it was in full bloom was the first time I realized that it could provide shelter for quite a few organisms. My whole life I have wondered what this country looked like before humans came and urbanized it, and this project gives me a small glimpse of what that would be. Therefore I am disappointed that there are people in the administration who do not like a project that has the potential to do so much good. Hopefully there is enough support for this project to keep it going for years to come. I love the hillside project. I think it looks great, and really don’t understand why the people in administration hate it so much. I can understand why some students would think it doesn’t look “good” compared to the rest of campus, but I think that if they learned more about it, their opinions would change. I love the wildlife it brings in and whenever I see it, I am reminded of how we can really have a positive impact on the environment around us just by making a few changes. I hope that the administration changes their mind because of all the feedback and in a couple years after I graduate, when I come back to JMU to visit, I hope the Hillside project still exists. I’ve enjoyed the Hillside project since it’s inception at JMU. I was as first disappointed when it was created since that was the best spot around to build a good ski jump when it snowed. However after reading the signage put up to explain the project I saw it in a much different light. It’s unfortunate to learn the administration is still getting their undergarments in a bunch over the project and how it looks from the interstate. Maybe they should encourage more flowers and colorful prairie being grown instead of sneak attack mowing it. I also noticed the retention ponds that Erica mention had been mowed down at the same time. Such a disappointment that so much life gets mowed over and the natural ability of the land to filter and retain water keeps getting diminished. I think we need to have President Alger and Dr. Warner come to our next out doors class at the project and learn what we hear ever day in class. If anything, the hillside project makes JMU looks more like a University and less like the White House. We are all here to learn, not to discuss the politics of what looks good. The hillside project is an amazing educational opportunity right in our backyard. If a university is meant to educate, then I do not see any logical reason why the hillside should be returned to manicured lawn. My visit to the hillside during taught me more in one hour than I could have learned in five hours of classroom time. The effectiveness of learning in an hands on environment beats the classroom every time. Like I said before, as a university education should be the top priority not appearance. The hillside project is beautiful and if we allow it to grow, everybody wins! Removing the hillside project and replacing it with a manicured lawn is boring and expensive, having to add fertilize, water, lime, rake and apply pesticides so we can just look at it is ridiculous. I too would hate to mow the lawn and this provides great diversity to the landscape and wildlife. The Hillside Project offers a unique experience for many people through hands-on experience. Not only is it a great educational experience for everyone it is an excellent cost saving project for the university. I completely agree with the fact that we need to encourage the hillside project and support the growth of a diverse prairie. I too hate mowing the lawn and look forward to learning from the benefits of a prairie in planting shrubs, flowers, and trees instead of a manicured lawn. I don’t understand why administration disagrees with this new landscape. The new hillside brings more birds, bugs, butterflies, and simply more color to the landscape besides ISAT. The riparian buffer and the creation of a more natural meandering stream are two other addition to the hillside. I look forward to future projects such as these and view them as a step in the right direction with the environment in mind. The hillside project is such a wonderful idea. I wish it were bigger! It’s a shame that we are accustomed to look upon places like this and only see weeds, yet we ignore all other senses that are appealing to land use such as this. People don’t get the fact that lawns can either be green or brown, the hillside project gives JMU a better wildlife. I, too, was delighted to see this while driving by on the interstate. I thought it was beautiful!